What is the difference between Divide and Conquer Algorithms and Dynamic Programming Algorithms? How are the two terms different? I do not understand the difference between them. Please take a simple example to explain any difference between the two and on what ground they seem to be similar. Divide and Conquer works by dividing the problem into sub-problems, conquer each sub-problem recursively and combine these solutions. 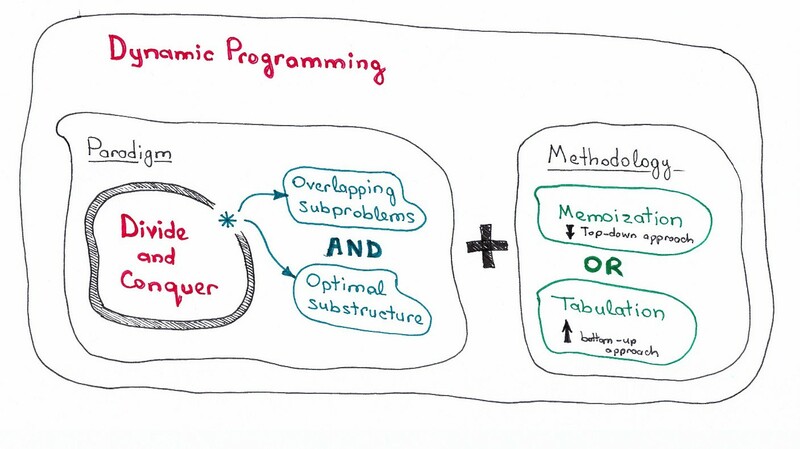 Dynamic Programming is a technique for solving problems with overlapping subproblems. Each sub-problem is solved only once and the result of each sub-problem is stored in a table ( generally implemented as an array or a hash table) for future references. 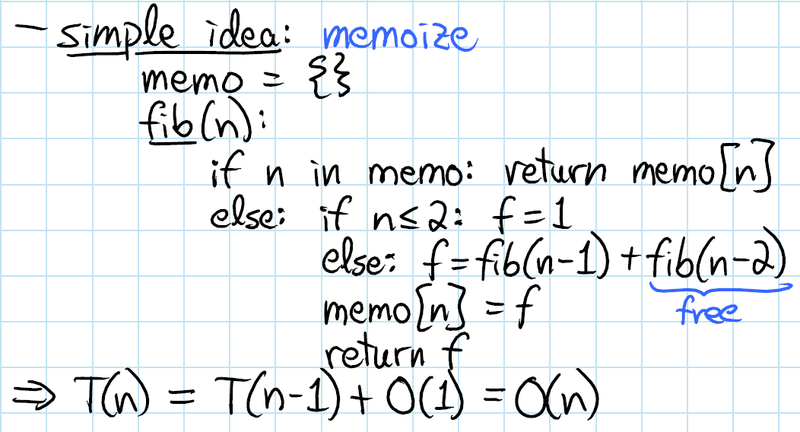 These sub-solutions may be used to obtain the original solution and the technique of storing the sub-problem solutions is known as memoization. A classic example to understand the difference would be to see both these approaches towards obtaining the nth fibonacci number. Check this material from MIT. Does more work on the sub-problems and hence has more time consumption. In divide and conquer the sub-problems are independent of each other. Solves the sub-problems only once and then stores it in the table. In dynamic programming the sub-problem are not independent. sometimes when programming recursivly, you call the function with the same parameters multiple times which is unnecassary. As you can see, whenever you need the multiple call you just access the corresponding variable to get the value instead of recalculating it. So the relationship to the Divide and Conquer is that D&D algorithms rely on recursion. And some versions of them has this "multiple function call with the same parameter issue." Search for "matrix chain multiplication" and "longest common subsequence" for such examples where DP is needed to improve the T(n) of D&D algo. Breaks the problem down into discrete subproblems. The recursive algorithm for the Fibonacci sequence is an example of Dynamic Programming, because it solves for fib(n) by first solving for fib(n-1). In order to solve the original problem, it solves a different problem. These algorithms typically solve similar pieces of the problem, and then put them together at the end. Mergesort is a classic example of divide and conquer. The main difference between this example and the Fibonacci example is that in a mergesort, the division can (theoretically) be arbitrary, and no matter how you slice it up, you are still merging and sorting. The same amount of work has to be done to mergesort the array, no matter how you divide it up. Solving for fib(52) requires more steps than solving for fib(2). As I see it for now I can say that dynamic programming is an extension of divide and conquer paradigm. I would not treat them as something completely different. Because they both work by recursively breaking down a problem into two or more sub-problems of the same or related type, until these become simple enough to be solved directly. The solutions to the sub-problems are then combined to give a solution to the original problem. So why do we still have different paradigm names then and why I called dynamic programming an extension. It is because dynamic programming approach may be applied to the problem only if the problem has certain restrictions or prerequisites. And after that dynamic programming extends divide and conquer approach with memoization or tabulation technique. Once these two conditions are met we can say that this divide and conquer problem may be solved using dynamic programming approach. Dynamic programming approach extends divide and conquer approach with two techniques (memoization and tabulation) that both have a purpose of storing and re-using sub-problems solutions that may drastically improve performance. For example naive recursive implementation of Fibonacci function has time complexity of O(2^n) where DP solution doing the same with only O(n) time. You may read more about memoization and tabulation comparison here. The main idea you should grasp here is that because our divide and conquer problem has overlapping sub-problems the caching of sub-problem solutions becomes possible and thus memoization/tabulation step up onto the scene. Since we’re now familiar with DP prerequisites and its methodologies we’re ready to put all that was mentioned above into one picture. If you want to see code examples you may take a look at more detailed explanation here where you'll find two algorithm examples: Binary Search and Minimum Edit Distance (Levenshtein Distance) that are illustrating the difference between DP and DC. I think of Divide & Conquer as an recursive approach and Dynamic Programming as table filling. For example, Merge Sort is a Divide & Conquer algorithm, as in each step, you split the array into two halves, recursively call Merge Sort upon the two halves and then merge them. Knapsack is a Dynamic Programming algorithm as you are filling a table representing optimal solutions to subproblems of the overall knapsack. Each entry in the table corresponds to the maximum value you can carry in a bag of weight w given items 1-j. Not the answer you're looking for? Browse other questions tagged algorithm dynamic-programming divide-and-conquer or ask your own question. How is this solution an example of dynamic programming? What is the difference between divide and conquer, and branch and reduce?